Crabbie’s are to continue their backing of Hibs with a new three-year deal which will see the drinks firm sponsor Easter Road’s Famous Five Stand. The company, founded in Leith more than 200 years ago, saw three years as the Capital club’s main sponsor come to an end as it was revealed the name of global bookmakers Marathonbet will adorn the front of the players’ shirts for the next two seasons. But Crabbie’s are to continue their support for Hibs in a deal which will also see their logo continue to appear on the back of the jerseys, the introduction of “The Crabbie’s Museum” highlighting the historical links with the firm, Hibs and Leith, and continued brand ownership of the popular supporters’ bar, Behind the Goals, within the Famous Five Stand. As the club’s “heritage partner”, Crabbie’s will also have exclusive brand rights to all stadium advertising sites within the Famous Five Stand and “an activation programme” that will include a number of supporter initiatives. 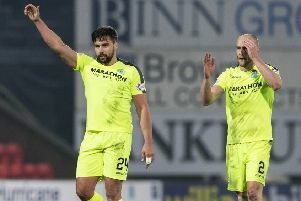 While no figure was given for Crabbie’s continuing sponsorship – the Marathonbet contract was said to be worth a “significant six-figure” sum when it was announced only a few days ago – it’s another important tie-up for Hibs, considering not only the current financial climate, which is making it difficult for other clubs to clinch such deals, but the fact relegation to the Championship doesn’t appear to have discouraged backers. Ron Young of Crabbie’s said: “We are delighted that we are continuing our association with Hibs for another three years. “We hope that this heritage partnership demonstrates our real long-term commitment to Hibs. New head coach Alan Stubbs, meanwhile, was expected to name former Everton coach Andy Holden as his assistant later today. While Stubbs has been reluctant to reveal the identity of his No. 2 until an agreement is in place, he said: “He’s going to be a fantastic addition to the staff. I don’t want to tempt fate until it’s all signed, but from my point of view I feel I’ve got the best man.